If you snooze, you lose. This saying is spot-on when it comes to being computer savvy and creating an online presence for your business. The North-West University (NWU) has recently partnered with the North West Department of Tourism to implement a digitally savvy business model to assist the North West Women in Tourism Chapter to enhance their businesses. The main purpose of this business model is to ensure that trainees enrolled in the chapter – all business women in the tourism trade – are exposed to various digital courses that will enable them to further improve their businesses. According to Dr Aaron Tshidzumba, a lecturer in the School of Communication Studies and E-Agro Tourism administrator at the NWU, these digital training courses will include topics such as social media awareness, creating an online presence and creating databases. “This will enable these trainees to use different platforms such as YouTube and Facebook – depending on their kind of business – to offer their clients a better experience,” says Dr Tshidzumba. 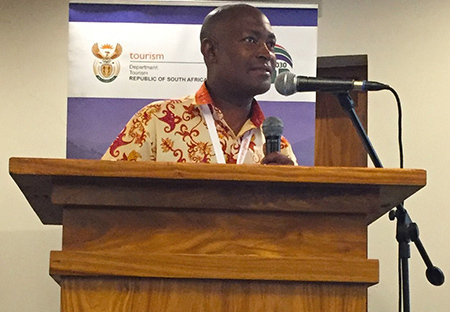 Dr Aaron Tshidzumba is the E-Agro Tourism administrator at the NWU.